Two Tigers invited to WPS combine: Senior Kat Tarr (pictured below) and former Tiger Jenifer Nobis (been playing in Sweden) were invited to the WPS combines. KU defender Holly Gault was also on the invitee list? Anyone know how the local women did? 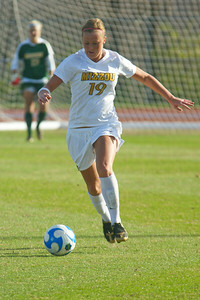 Speaking of the ladies from Columbia, MU Tigers going to Brazil on a mission trip. They will be performing community outreach programs and also managing to get some soccer in with some pretty good competition. Sounds like these ladies will have some fun. Ives has the Generation Adidas draft class. It sounds like UCLA midfielder Michael Stephens is still in negotiations with MLS. Since Baggio Husidic is already signed and Stephens is (maybe) close to signing, both of the creative midfield players that the Wizards have been linked to in mock drafts could end up Gen Adidas. That can only help the salary cap. MNT:How did Santa do? Sounds like he did pretty good for Jewsbury. Not only did Jack get called into the National team camp, but we find out that he and his wife are expecting a baby girl this spring. Has there been a baby boom at Swope Park? Seems to me like there should be a pretty good youth team in a couple years.